If you want to do your own composting for your own garden at home, then a tumbling compost maker is worth considering as an automated option. There are many traditional composting methods available. These range from the simple compost heap and all the way through to this type of automatic option. It is of course perfectly fine to have a fixed compostor, or a simple compost heap, and then turn it over using a garden fork. However, that type of work can be tough on the back, your shoulders and your arms. A tumbling option does make light work of the turning over task when composting. That is the key benefit of owning one of these makers. In this article we will be reviewing the top 5 tumbling composters, that are currently available on the UK market. We have included buyer satisfaction ratings, and also what buyers said, as these give the best indication of which the best composting products really are. We will also include a detailed buying guide down below. However we understand that some of you may not have the time to read this information. Therefore we have included just below, a table of the top 5 rated tumbling composters. We have included a product link, where you will be able to go to Amazon, and read more information. How Do Tumbling Composters Work? How Long Does it Take to Make Compost in a Tumbler? The table below shows you the best rated of these on the UK market. We have included the brand name, the composter capacity, an average RRP, and a buyer satisfaction rating. In almost all cases you should avoid paying Recommended Retail Prices (RRP) as you can normally find these cheaper online. For us the number one choice of the "Most Beautiful Composter" model is a good choice. A strange name we agree and certainly no a shy name. This one is however extremely well made and as the manufacturer states, "it is built like a tank." You can buy this one in a black colour and believe it or not in a startling pink colour. It is made from food safe, BPA free, rust free materials and will not fade under the sun's UV rays. 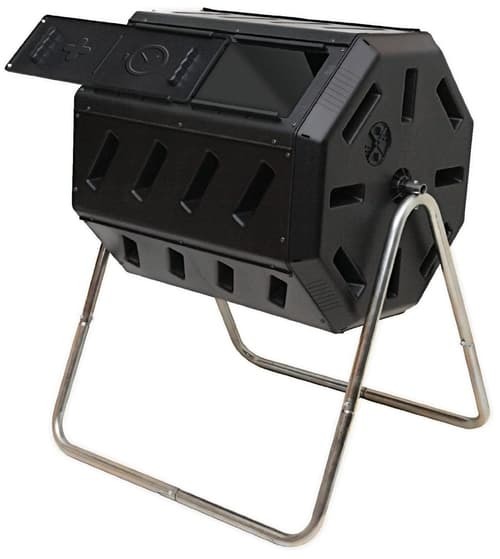 This is an outdoor composting system that combines a compost tumbler drum with a compost tea maker base. The drum rotates on top of the base to create solid compost, and if you choose to do so, the base allows you to collect the excess liquid from the drum as compost tea, a precious liquid fertilizer. 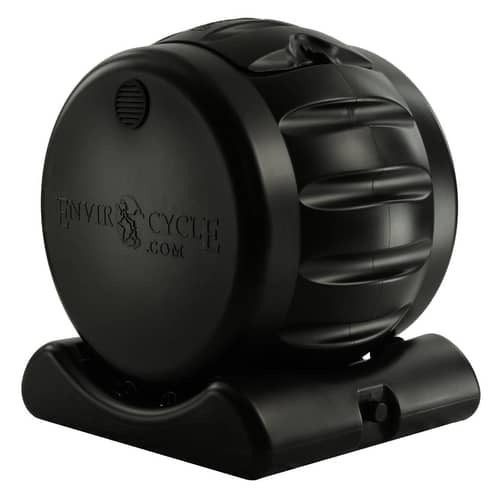 This is a dual composter and makes mixing easy and efficient. At the early stages simply turn the composter 5-6 times every 2-3 days. 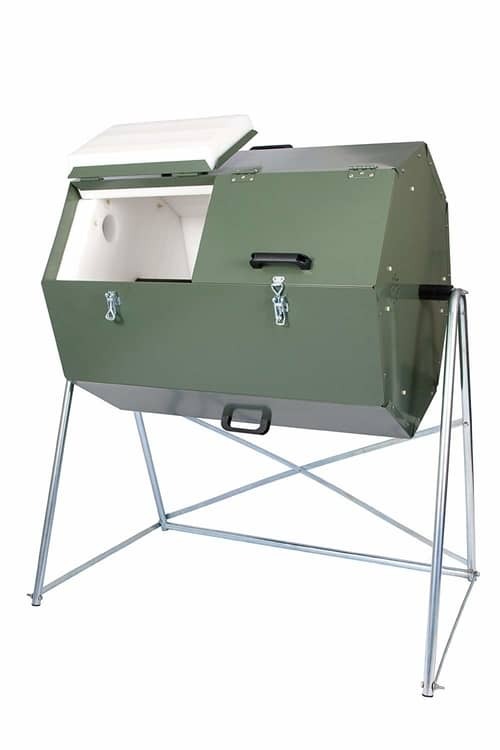 This composter has wide openings and a removable door. That makes it quick and easy to add scraps/clippings and also to remove finished compost. As it is dual there are two separate sides allow the first side to finish while leaving the second side available to add fresh scraps/clippings. The capacity is 37 gallons (5 cu ft) or 168 litres. 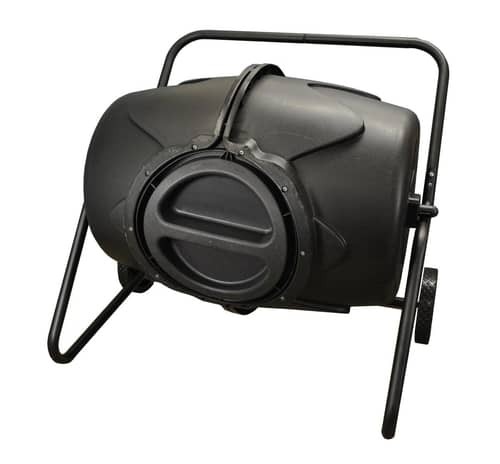 The Draper 180 litre Tumbling Composter speeds up the whole compositing process. They recommend that you tumble the bin regularly every 2 – 3 days. It is made from polypropylene and is held off the ground by a frame which has lock and pivot points. The barrel has ventilation and has twin ended access. This compost tumbler has a horizontal rotating drum which makes it easy to turn when full. It does come as a flat pack, and as such will require some assembly. It is manufactured from heavy duty plastic. It has a locking panel that sits in the middle of the drum. This panel seals the opening for putting organic waste in and stays tightly sealed when tumbling. The manufacturer recommends tumbling every 2-3 days, depending on the outdoor temperature. Inside there are a set of mixing spikes, these will mix and aerate up the organic waste as it is tumbled. This is the most expensive option on the list. These Joraform composters are designed in Sweden in response to tough recycling regulations. They are used in schools and kindergartens, where they make a good educational tool for young students. It is made from galvanized steel for longer sustainability. As an experienced gardener, I started out with what is pretty much a standard compost heap. Much as I liked it, my other half was not quite so appreciative of my efforts. Aside from the smell it created, the insects it attracted and the way it looked, I thought it was OK. I have to say, and especially with a young family at the time, I was in the minority with my beloved compost heap. I did make the change and moved over to a compost bin, a much better solution, and certainly a more effective and tidier solution all round. I used a few of those over the years. As the years rolled on, even they became quite a bit of work. We all know that it takes heat, and air circulation to make compost. That does mean turning the heap over from time to time. 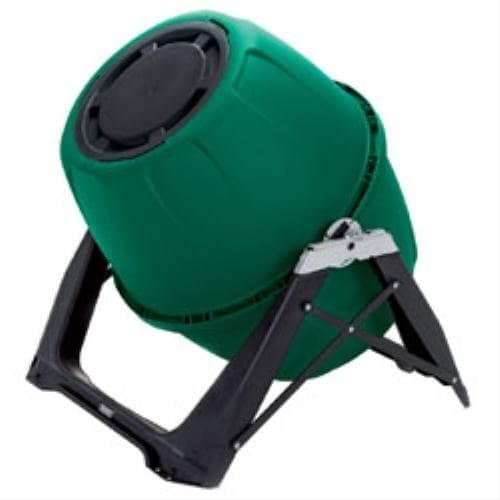 Well the reality is that this type of composter just makes that task a great deal easier. Now I still have my rich organic material, but without any of the down sides. As I mentioned earlier, the traditional barrel style is still the most popular. A lot of people now prefer the split bin type, where you can split your waste up and have two batches going. (Dual composter explained below) It is simply a matter of adding garden waste , and house waste in each barrel and then have a regular supply of compost. It is simply just a matter of preferred style, and how much compost you want at any one time. Personally I like the single tumbler. At the end of the day, these are not complex pieces of equipment. In one way or another it is a plastic barrel that can be rotated. They all have some form of aeration, usually small holes and I would recommend adding some soil initially and a commercial starter to kick the process off. These tumblers are great at keeping the heat in, allowing plenty of air in, and then being fast and easy to turn when required. TOP TIP - My grandchildren love spinning these around!! After that, turn the barrel 2-3 times a week, and in about 4-6 weeks you will have your very own rich organic compost. The simplest way to describe these is that there are two bins on the composter. You can then let one bin cook and fill the other bin with fresh materials. That means you will have two lots of compost being prepared, and they will be ready at different times. It is a bit like having two batteries with a power tool. You can be using one, and have the other one on the charge, so as it is ready when you need it. With a dual compost tumbler, it will take a few weeks to a couple of months to fill one bin. The two bins rotate separately and that gives you full control over the composting process. These are good for what is termed "batch composting." They are very user friendly as you can fill one side with kitchen and yard waste. When that is filled you stop and allow it to ferment. At this early stage you can then turn the bin every few days. While that batch is fermenting you add your kitchen waste and garden waste to the other bin. You then simply repeat the process. Below I have listed a number of key benefits of owning a tumbling composter. I am sure I have no need at all to convince you of the beauty of having your own natural fresh organic compost. A compost bin is a more effective and productive way of doing that, than a compost heap. It is as I have mentioned, also way better looking than a steaming heap. The key benefit though is that as you can rotate this, it takes the back breaking effort out of the whole process. There are other benefits though, which I have listed down below. With any type of heap, or slatted compost box it is almost inevitable that you will attract rodents, and let's face it, who wants rats about your garden. The tumbling compostor is off the ground, is made from hard plastic, and the lids seal really well. That keeps rodents at bay. As well as taking the pain out of compost making, their design assures your success. They hold heat, allow air in and with the right commercial starter, you can have high quality compost in 1-2 months, depending on the climate. Rain does not affect this type of product. However many potential buyers are concerned about hard frosts. I am thinking particularly of people living in the higher areas of Scotland. The good news is that this type of plastic is tough, and will be able to handle even he toughest of winters. All you have to do is find a sunny location, quickly assemble your composter, and then get started. They really don't take up much room, and look a lot better than the old dung heap style. Gardeners have been composting for years. There really is not a great deal to making your own compost. This type of compost container, has been around for years, and they have improved in quality over time. With these you add green waste (grass clippings and kitchen scraps -25%) and brown waste (leaves and straw - 75%) and then leave them alone to allow the heat to build up. After a couple of weeks, then turn them 2-3 times a week, and after a few weeks you will be well pleased with the results. This may surprise you, but the reality is that a normal compost heap, assuming you turn it once a week takes about 10-12 weeks depending on weather conditions. It is worth noting that if you use a commercial starter, you can reduce these times to about half of those shown above. Our advice is that as long as you are fit and healthy enough to be able to turn a compost heap with a garden fork, then keep on doing that. The tumbler really helps a lot with the turning aspect, and does take the back breaking work out of the process. It is also a much neater solution as there is no unsightly heap. If in any doubt as to how these work, check out the 2 minute video below, where everything is explained. If you have an old plastic barrel, you can of course make your own. You will need some sort of stand and a method to turn them, but with a little imagination, easy enough to do. Most people though will not have the parts, time or patience. To be honest, a handy man that I am, for me it is not worth the effort. These are not crazy money, with a high quality one costing under £100. At that price I don't need the hassle of a DIY version. I trust that you found the information provided here useful. For me I already know the benefits of making your own compost. It saves you a lot of money, is just nice to be able to do it, and one of these just makes life that little bit sweeter. Hopefully you now have enough information on the best tumbling composters in the United Kingdom.